31st January 2019 marks the centenary of what became known as the Battle of George Square, also known as Bloody Friday. At least 60,000 people on strike from their work crammed into George Square in central Glasgow, in front of the City Chambers. 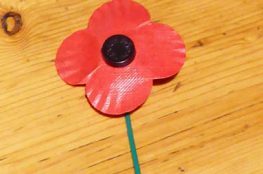 The huge gathering was the culmination of a campaign to reduce the working week from 54 to 40 hours in a bid to share out the work in Clydeside’s shipyards, forges and factories among the existing workforce and men coming home from the First World War. The government in London and the authorities in Glasgow didn’t believe that and panicked, fearing a Bolshevik revolution was planned. Winston Churchill, then secretary of state for war, dispatched soldiers, tanks and machine guns north. These turned more into a show of force than anything else and there were no tanks in George Square. However, there were police with batons and when they charged a section of the crowd, quite a number responded, with running battles breaking out. Nobody was killed but over fifty people were injured, official figures say thirty-four strikers and nineteen policemen. 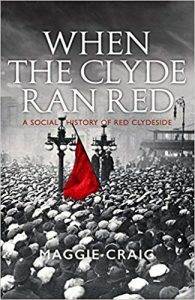 I wrote about the Battle of George Square in my book When the Clyde Ran Red: A Social History of Red Clydeside. The cover shows a section of the famous photograph taken in George Square on that day one hundred years ago.